Product prices and availability are accurate as of 2019-04-25 14:33:02 UTC and are subject to change. Any price and availability information displayed on http://www.amazon.com/ at the time of purchase will apply to the purchase of this product. Cantu shea butter leave in conditioning repair cream is an intensive deep penetrating leave in cream conditioning treatment that is made with pure shea butter and other natural oils to stop and mend breakage, repair split ends, and add manageability and shine with every application. When used daily, cantu shea butter leave in conditioning repair cream helps promote strong, long healthy hair. 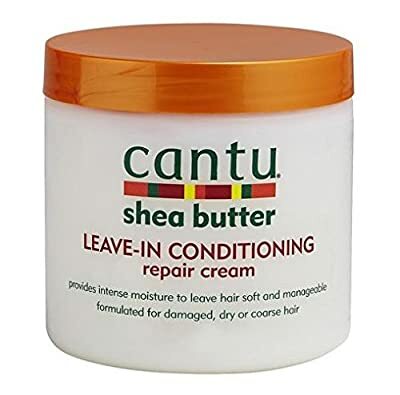 SHEA BUTTER LEAVE-IN CONDITIONING REPAIR CREAM By CANTU Conditioner is a excellent leave in for naturally curly hair. It can be used daily on naturally curly hair. It gives excellent shine and curl definition. If you do not like to use gels to define their curls then this product will work for you. Warnings: Wait 24 hours after hair coloring To apply any styling or conditioningtreatment/avoid applying any styling or conditioning product directly onnew growth./always remove or neutralize chemical treatments before anystyling or conditioning product/hair burns. Keep away From flames/keepaway From children. Directions: Daily styling-- apply To towel dried hair. Work a generous amount ofproduct into hair beginning at the roots To the tips. Comb through foreven distribution. Do not rinse. Apply more To longer hair at the endsor problem areas. Leave in treatment--apply as directed for "dailystyling" just after shampooing. Re-apply And cover with a plastic capovernight for maximum absorption And intensive conditioning. Ingredients: Water, Butyrospermum Parkii (Shea Butter), Glycerin (Soja) Soybean Oil, Propylene Glycol, Dicaprylate/Di- Caprate, Ppg1, Trideceth-6, Cetyl Alcohol, Glycerine, Stearalkonium Chloride, Trimethylsilylamodimethacone, Panthenol, PPG-1-Peg 9 Laurel Glycol. Ethyl, Lanolin Oil, Cinnamidopropyltrimonium Chloride, Hydrolyzed Collagen, Protein, Benzophenone-3, BHA, BHT, Zea Mays (Corn Oil), Idopropynolbutyl Carbonate, DMDM Hydantoin, Phenoxyethanol, Fragrance.